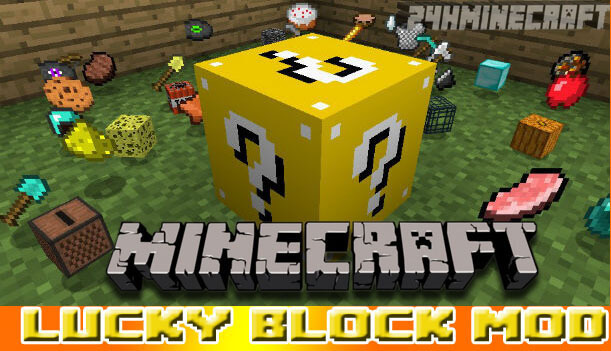 Home » Minecraft Mods » Lucky Block Mod (1.12/1.11.2/1.10.2/1.7.10) – Good Luck! 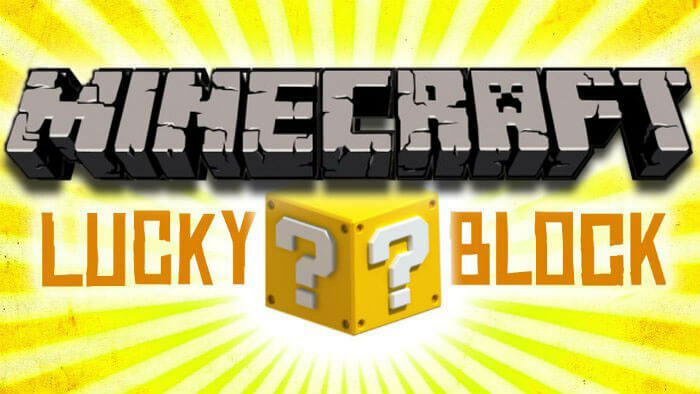 1 What is Lucky Block Mod? What is Lucky Block Mod? With hundreds of possibilities to Minecraft, you simply mine one lucky block, pray hard and hope that it will surely drop those things that you will need ahead. Wait! It is all about few items? No, because with latest Lucky Block mod 1.11.2 you can expect more than a few items as it can spawn monsters, animals, structures and many other entities. Ranging from fireworks to giants, diamonds to sticks; this lucky block can give you anything beyond your expectations and you will get something new every time when you will mine it. There are three different structures for wishing wells; just throw a coin and watch which one is for you. Contains three trading villagers who will provide you various lucky tools, weapons as well as armours at very reasonable price. You will also be able to get a Giant slime that will appear taller than trees or sometimes like a magma cube. A lucky potion can appear with various positive effects. One unlucky splash type potion that brings some negative effects randomly. Dreadful tamed wolves that may appear with collars of different colours. Various tamed cats wearing colourful skins. Lovely banquet full of attractive flowers. Some random and useless but humorous jokes. Don’t you need some gold? Ohh! It may not be much helpful this time. Wait, clocks are prettier but are it possible to look at sky? Other cool armour can be designed with gold but unfortunately it is cannot bear more than four hits from Zombie. Hey! These gold tools are much better but they can last only for few moments. Actually it is difficult to decide what is more important while you are going through Minecraft.exe because one mod is going to make all these decisions for you and results will depend on your luck. 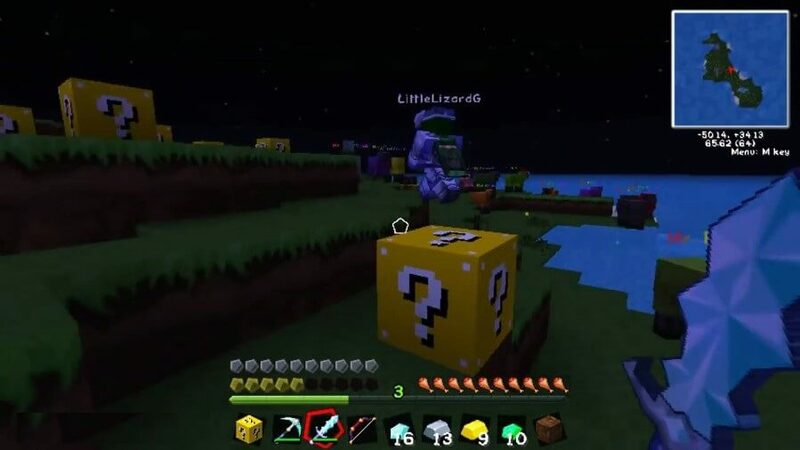 Yes, there is a lucky block mod 1.10.2 , 1.11.2 present in your game which can drop anything, anytime, beyond your expectations; yeah it could be diamond, spawns and even some structures ahead your way. This lucky block can be easily crafted with four gold ingots as well as a dropper or sometimes can also be found unexpectedly in the Minecraft world. Whenever you will mine this block you will have opportunity to get some interesting items, structures or some entities. These Lucky block mod Minecraft can also be generated from various custom structures. The currently available structures are ‘greek temple’ structure as well as wreckage of few netherracks and stome bricks. 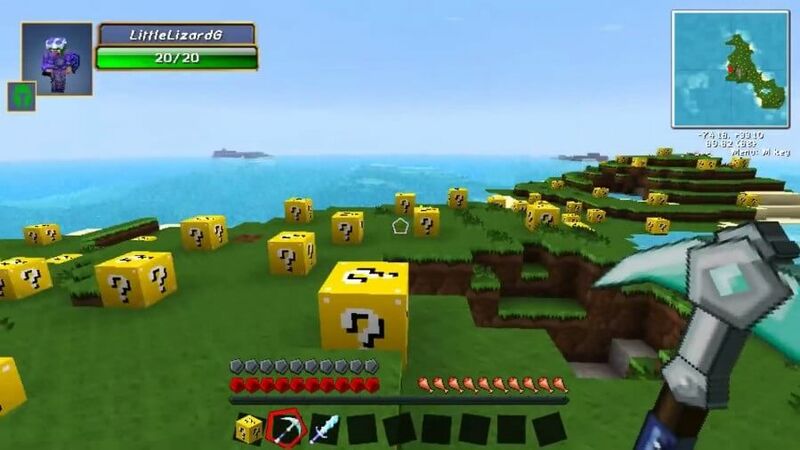 Lucky blocks in Minecraft temple ca have various luck levels ranging from 50 to 100 whereas in case of wreckage this variation is between -50 to -100. In Minecraft as per default settings one can assume 50-50 chances for lucky block spawn as well as of its presence in a structure. This lucky block can have luck level ranging from -20 to 20. Warning: If luck block result is not in favour of you then it may lead to some ill effects on your Minecraft world. So it is important to have a backup for your world that can be useful at time of risks. The lucky block will drop itself when harvested with a silk touch pickaxe. Each Lucky Block can have a pre-defined list of drops rather than using the drops in the config file. These can only be specified using commands, as below. A Lucky Block in your inventory with custom drops will say “Has custom drops” when you put your mouse over it. The luck is a number between -100 to 100 and is the luck level of the Lucky Block. This gives a Lucky b]Block with a luck level of 50 that will only drop wooden swords or make forts. The more likely drop will obviously be forts, since it has @luck=2 and the lucky block has a luck level of 50. Note that you will only be able to specify a very small amount of drops when typing this in chat, because there is not enough space. However, a command block allows for much longer commands. 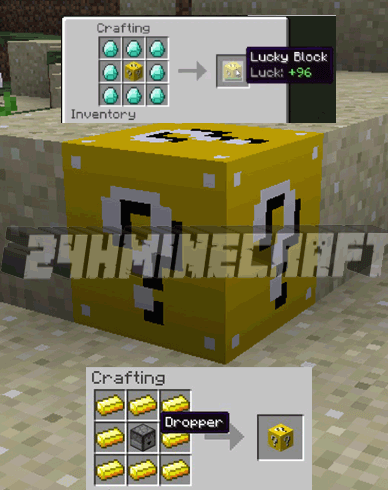 Download the Lucky Block Mod. Download a copy of the Lucky Block Mod jar (zip) and save it to the directory %appdata%/Roaming/.minecraft/mods. The mods directory is created by Minecraft Forge in the previous step.